Following on from some of the research I did for my project Infestation Piece (Musselled Moore) 2006–8, exhibited in Toronto in 2008, and from my interest in Henry Moore as the first British artist to have a truly global career (a phenomenon that initially coincided with the beginnings of the Cold War), I started to investigate the story surrounding the making of his piece Nuclear Energy 1965. This was a sculpture that was commissioned to mark the site of the first sustainable nuclear reaction (Chicago Pile-1), orchestrated by Italian physicist Enrico Fermi in a subterranean former rackets court on the campus of Chicago University. My research began prior to an invitation to exhibit at the Hiroshima City Museum of Contemporary Art and, when that invitation did come, immediately connected me to the Atom Piece 1963–5 sculpture ( a working model for Nuclear Energy) in the museum’s collection, and to the controversy surrounding its presence in Hiroshima. Aided by the Henry Moore Archive at Perry Green and a number of key texts, including those by Iain Boal and Tate curator Chris Stephens, I attempted to track the development of the form that became both Nuclear Energy and Atom Piece, and the events that led to its existence in these two very different locations. Due to the sculpture’s links to Moore’s Helmet Head works, to F.H.K. Henrion’s famous CND poster (1963) and (after the fact) to an elephant skull given to Moore by Julian Huxley, once the original maquette was completed, I began to think about the idea of piecing together the scenario for a play or masquerade that might allow for some of these stories to be dramatised. I connected the idea of the mask to Japanese Noh theatre and to a particular sixteenth-century Noh play, Eboshi-ori. This tells the story of a young aristocratic boy, Ushiwaka – the son of Lord Yoshitomo, the defeated head of a once powerful clan – escaping from enforced servitude in a Buddhist temple with the help of two gold merchants and a sympathetic hat-maker who agrees to make a particular kind of Eboshi-ori hat with which to disguise himself. I worked with a Noh mask-maker, Yasuo Miichi, in Osaka to create a set of masks that fuse traditional Noh masks with characters both historical and fictional who were contemporary to Moore, including Anthony Blunt (the hat-maker’s wife), Joseph Hirshhorn (Kumasaka), James Bond (the gold merchant Kichiji) and Enrico Fermi (the messenger). 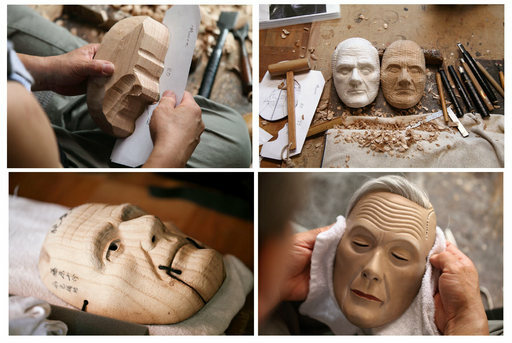 Further to this, documentation of the mask-making process serves as the backdrop for a short film that collapses the story of Nuclear Energy’s journey from the Chicago birthplace of the Manhattan Project to a hill-top museum in Hiroshima on to the ancient tale of Ushiwaka and his flight from the past. Simon Starling,Tate St Ives, 5 February – 2 May 2011. 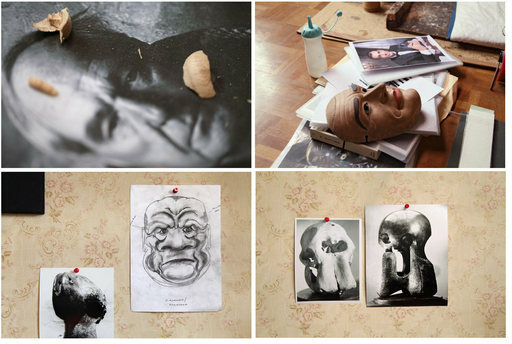 Project for a Masquerade (Hiroshima) is at Hiroshima City Museum of Contemporary Art, 22 January – 10 April 2011. Never The Same River (Possible Futures, Probable Pasts), selected by Simon Starling, is at Camden Arts Centre until 20 February 2011. More information on Starling’s Infestation Piece (Musselled Moore) is available here.